When I first learned about the possibility of using food as medicine, one of the very first foods I started eating was shiitake mushrooms. These mushrooms are renowned in Japan (and in Macrobiotic cooking), for their healing properties. What makes these mushrooms stand out from other famous fungi? Well, first and foremost they are packed with B vitamins and vitamin D (if they are sun-dried). They contain copper, one of the few metal elements essential to human health. They also have anti-viral, anti-fungal and anti-bacterial properties. Shiitakes are rich in lentinan that heals chromosome damage and fights cancer. And, most importantly, they are DELICIOUS! When using food as medicine, it should taste really good, otherwise you’re not going to want to eat it. 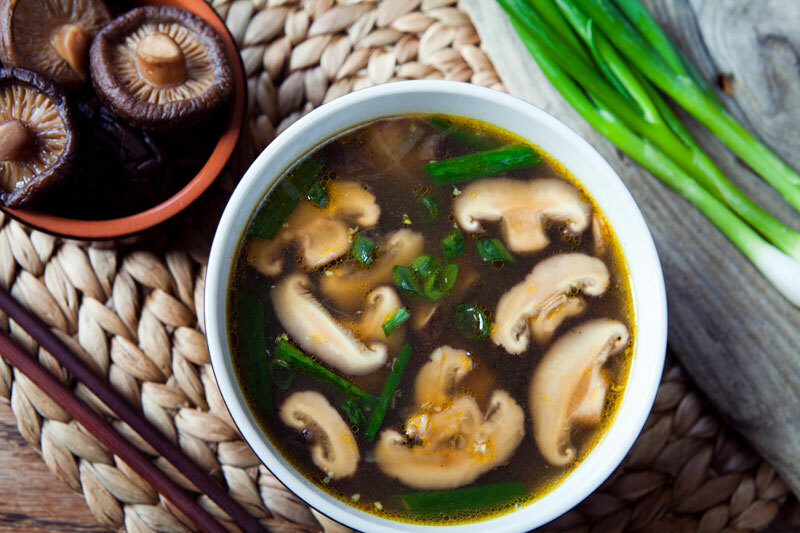 So, get yourself some shiitake mushrooms and put them into soups, stir fries, and sautéed veggies. Due to their popularity, you can find shiitake mushrooms at most grocery stores and health food stores. You can also find them dried. For this recipe below I used sun-dried mushrooms that are rich in vitamin d. And, that’s especially good throughout the winter months. Add oil into a soup pot. Bring heat up to medium high and saute onion with a few pinches of sea salt until lightly caramelized (about 15-20 minutes). Strain the shitake soaking water and add to the broth. Thinly slice the shiitakes and add to the broth. Add garlic, remaining salt, and chili pepper flakes. Cover and reduce heat to simmer for 5-7 minutes. Garnish with fresh parsley and scallions.